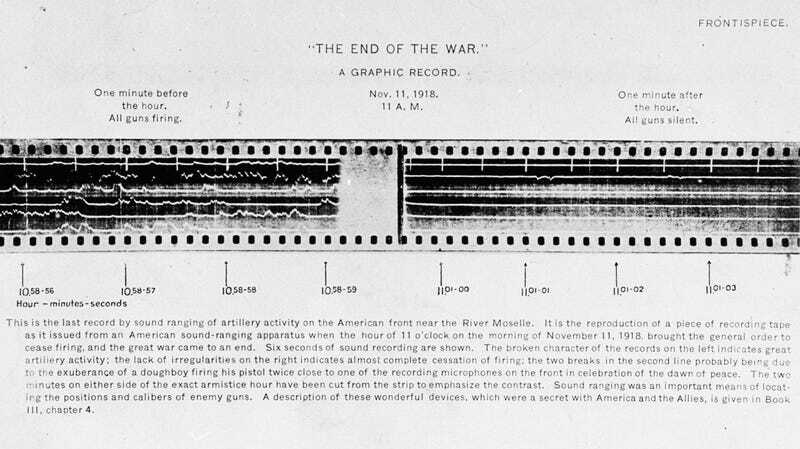 Above we see seven seconds of an audio recording from November 11, 1918. On the left we can see three seconds of guns firing. In the middle? The official time of the ceasefire to end World War I and a sudden reprieve from the staccato of weapons blasting. On the right, the first three seconds of peace. An uneasy silence, no doubt. This is the last record by sound ranging of artillery activity on the American front near the River Moselle. It is the reproduction of a piece of recording tape as it issued from an American sound-ranging apparatus when the hour of 11 o'clock on the morning of November 11, 1918, brought the general order to cease firing, and the great war came to an end. Six seconds of sound recording are shown. The broken character of the records on the left indicates great artillery activity; the lack of irregularities on the right indicates almost complete cessation of firing, two breaks in the second line probably being due to the exuberance of a doughboy firing his pistol twice close to one of the recording microphones on the front in celebration of the dawn of peace. The two minutes on either side of the exact armistice hour have been cut from the strip to emphasize the contrast. Sound ranging was an important means of locating the positions and calibers of enemy guns. A description of these wonderful devices, which were a secret with America and the Allies, is given in Book III, chapter 4. The left half of the image helps one imagine just how horrifically precise and cruel war can be. The end of a war is negotiated and fought over. And even after warring factions agree to terms, people on both sides can still die. So who was the last person to die for such a worthless war? American solider Henry Gunther of Baltimore, killed just one minute before 11am.